You might not feel it personally, but Earth’s rotational spin axis—is shifting. Around the beginning of the 21st century, scientists started noticing that the North rotational pole was moving eastward. Now, scientists from NASA’s Jet Propulsion Laboratory believe they have a plausible reason as to why. Earths rotational axis is constantly shifting – that’s nothing new. It’s because Earth (and any other planet in existence) isn’t a perfect sphere. It’s imperfect, cover with bumps and chasms. “If you take a chunk of material from some area, you are breaking the symmetry, and the spin axis starts moving,” stated Surendra Adhikari from the Jet Propulsion Laboratory. But this most recent shift is different, because Adhikari has linked it to human interference. His findings are published in the journal Science Advances . There are two main causes: The Greenland and West Antarctic ice sheets are melting, and our global water supply is drastically shuffling all around. 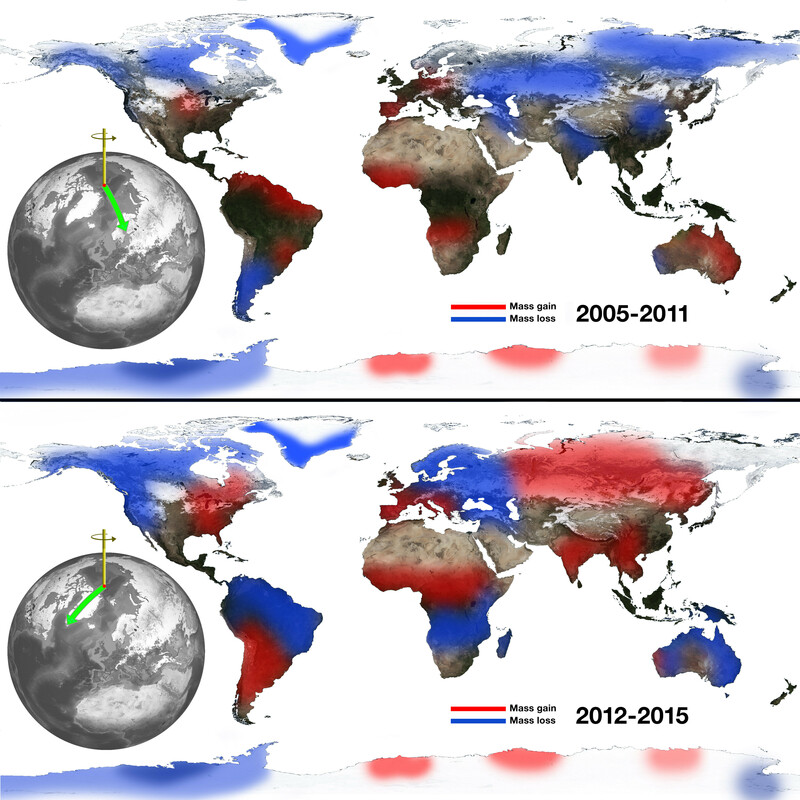 Thus, human-caused disturbances are literally causing changes in the planet’s poles. Since 1899, scientists have been keeping track of the migration of Earth’s North rotational axis. They first noticed that it was moving West towards Hudson Bay, associating it with the melting of the Laurentide ice sheet. But around the year 2000, it completely changed course and started heading East. Not only that, but it’s now moving twice as fast. The melting of the Greenland ice sheet is believed to be the major influencer. Ice sheets aren’t the only culprit—so is global water storage, particularly across Eurasia. Humans like to pump and distribute a lot of groundwater across the globe. This makes some places drier than others, and it adds a whole bunch of new bumps and chasms that change the Earth’s North rotational axis ever so slightly. There is one cool thing about all of this though, and that’s that researchers can trace the history of climate change by looking at the shifts in the Earth’s rotational axis. This research is being undertaken by Adhikari and JPL hydrologists. There is also another fact to look at in all of this: Humans really are dominating the planet’s natural systems. Because of this, scientists have been discussing whether or not to call the next epoch, the “ anthropocene ” – an epoch dominated by human and machine. We should know later this year if this change will take course, since a group of scientists will be discussing this formal proposal.